The $552.1 billion defense budget approved by Congress calls for new regulations on cyberweapons an effort to prevent the pervasive digital bombs from further spreading throughout the world at the same time that it dramatically boosts spending on them. Section 940 of the National Defense Authorization Act for Fiscal Year 2014, signed into law by President Obama Thursday night, calls for “Control of the Proliferation of Cyber Weapons” following increases in the clear and present danger from cyberbombs such as Stuxnet and growing teams of hackers in foreign countries. “The President shall establish an interagency process to provide for the establishment of an integrated policy to control the proliferation of cyber weapons through unilateral and cooperative law enforcement activities, financial means, diplomatic engagement, and such other means as the President considers appropriate,” the act declares. The goal of the $2 million Cyber Security Initiative: suppressing the trade in cyber tools and infrastructure that can be used for criminal, terrorist and military activities, while still allowing governments to use those tools in legitimate self-defense. Other high-tech weapons show up in the defense spending bill, notably $100 million meant to improve an outer space “kill vehicle” that travels at hypersonic speeds. The “exo-atmospheric kill vehicle” is built by Raytheon Missile Systems, and is viewed as a key part of the U.S. Department of Defense’s shield against intercontinental ballistic missiles. If a threat is detected from sensors on either land or in space, a rocket blasts the weapon to the edge of space, where it deploys and travelling at speeds of up to 4 miles per second smashes into an incoming missile, destroying it. That’s the theory anyway. But the system has faced persistent problems, leading the Pentagon’s Office of the Inspector General to begin a “quality assurance assessment” in Sept. The 2014 budget takes a cautious approach to the Kill Vehicle, including guidance on how to improve it and test it successfully over the next five years. “It is the sense of Congress that the Secretary of Defense should not procure a Capability Enhancement II exoatmospheric kill vehicle for deployment until after the date on which a successful intercept test flight has occurred,” it reads. It also includes hundreds of millions to further drone warfare, including $352 million for the MQ-9 Reaper an armed, autonomous attack plane built by General Atomics more than $80 million more than requested. The word “cyber” shows up 12 times in the 2012 defense appropriations bill. It pops up 61 times in 2013. The word makes 127 appearances in the 2014 bill, which catalogs the nation’s efforts to deal with the growing threats to cyberspace like never before. The bill calls for hundreds of millions of dollars for cybercombat: the construction of cyber “ranges” to train cyber forces against threats known and unknown, a new analysis of overall cyber operations, an inventory of the military’s existing cyber skill set and the creation of a new Principal Cyber Advisor to supervise defense of the United States against all incoming digital threats. 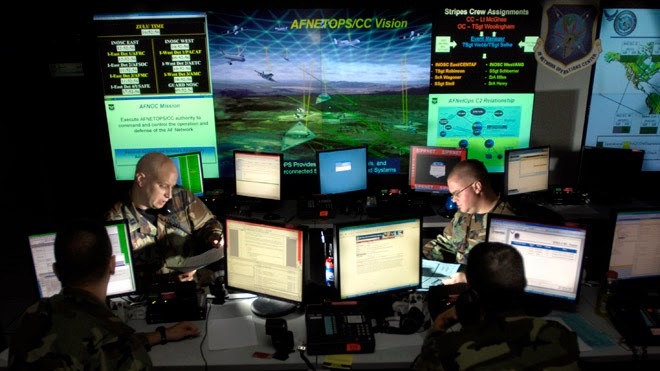 The bill allocates $169 million to build or expand facilities to house all that cyberwar gear in Maryland, at Fort Meade’s Marforcybercom HQ-Ops Building and the Cybercom Joint Operations Center, Increment 1.